Posted February 14, 2017 & filed under check 21, convenience & Simplicity, E-Services, Feature-Functionality, Sharetec's E-Services. With the financial industry moving to electronic clearing of check items, your credit union needs a cost-effective option to scan, store and transmit your daily deposits. 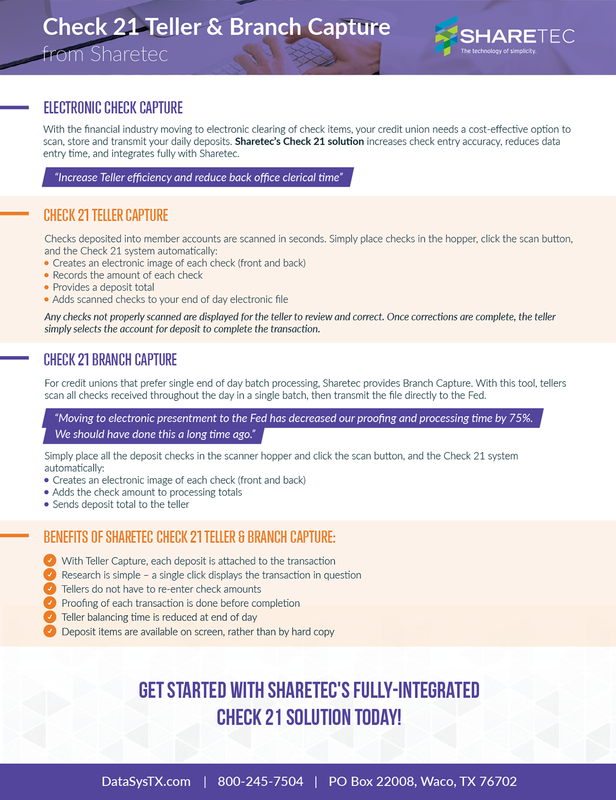 Sharetec’s Check 21 solution increases check entry accuracy, reduces data entry time, and integrates fully with Sharetec. Any checks not properly scanned are displayed for the teller to review and correct. Once corrections are complete, the teller simply selects the account for deposit to complete the transaction. For credit unions that prefer single end of day batch processing, Sharetec provides Branch Capture. With this tool, tellers scan all checks received throughout the day in a single batch, then transmit the file directly to the Fed. Download the Check 21 info sheet here.